For instance, let’s say you’re an attorney that specializes in DUI cases. Even if you took on a pro bono client, and got the case dismissed, there’s still a pretty good chance that the client wouldn’t feel comfortable leaving a review. The same principal may apply to doctors, funeral homes, debt consolidation companies, and so on. The point is there are certain products and services that consumers may not want to be associated with on public platforms. In the past, I’ve written about why reviews are important, how to suppress negative reviews, and how to get positive reviews to stick. In this post, I’ll explain how businesses can get more reviews, even when customers are less likely to do so. Asking for reviews can be a bit uncomfortable, especially in sensitive or taboo industries. That’s why it’s important to remind your customers how much you appreciate their honest feedback. Make it about them and their experience. Explain to them that their feedback helps you understand what you’re doing right, and which areas could use some improvement. There are a variety of review platforms out there, but Google, Yelp, and the Better Business Bureau (BBB) are among the most popular, and as a result, the most trusted by consumers. Each of these review sites has their own set of rules and criteria when it comes to soliciting reviews. So before you start asking customers for reviews, it’s important to make sure that your business is adhering to their review guidelines. All three platforms have a very strict policy against incentivizing reviews – i.e. offering cash, gift cards, prizes, discounts, etc. in exchange for a review. Each platform adamantly prohibits solicitation of reviews; however, the definition of solicitation varies depending on the platform. Google – Google encourages businesses to remind customers to leave online reviews. Just beware of their spam filter. According to Google, “soliciting reviews is suspect behavior.” If Google detects an unusually high influx of reviews in a short period of time, the reviews could be flagged as spam. Google recommends asking customers for reviews “immediately after you’ve done business with them,” instead of sending out an email blast to all of your past customers. 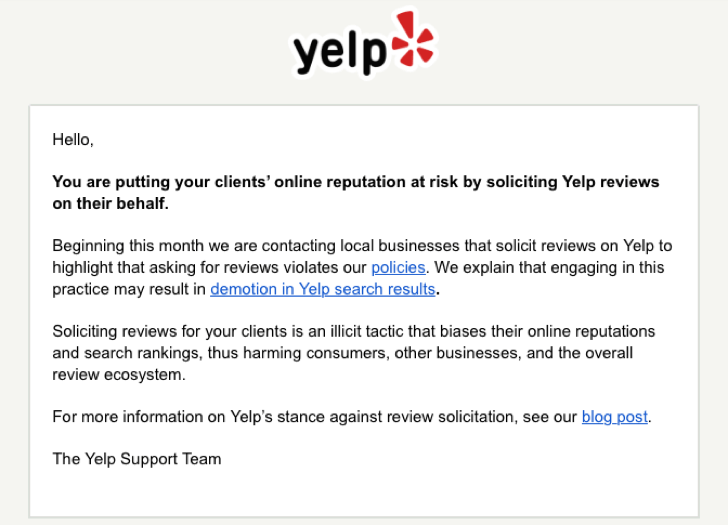 Yelp – Yelp’s policy is a bit more restrictive than Google’s. Yelp allows businesses to use Yelp’s branding and signage, and like Google, they encourage business owners to you to tell their customers that they can be found on Yelp. The caveat is that you can’t ask them to review your business. I know it sounds like a case of semantics, but Yelp has taken a strong stance on this. They have recently begun calling out businesses that they believe are violating their solicitation rules. Better Business Bureau – The Better Business Bureau is probably the laxest of the bunch. In fact, they even put together a guide to help businesses solicit customer reviews, and it turns out they have some really cool ideas. In addition to asking customers to submit their own customer review, it’s a great idea to encourage them to read your other reviews with links on your website or email signatures. At the conclusion of a sale or service, ask for a review with a follow-up email, postcard, or sticker on the sales receipt. Online reviews appear publicly, and to many consumers, it can feel like an invasion of privacy. The most obvious solution is to get customers to leave anonymous reviews. The problem is that all three platforms I mentioned prohibit anonymous reviews. The good news is each of these review platforms comes with its own special loophole. Google – Although Google doesn’t offer true anonymity, Google does allow users to leave a review under a pseudonym. The only requirement is that users would need to create a Google account under the fake name/persona. Yelp – Like Google, Yelp doesn’t allow users to leave anonymous reviews, but since they only display the user’s first name and last initial, and users aren’t required to add a profile photo, they can remain somewhat anonymous. I say “somewhat” because your review would be public, which means your friends (on Yelp) would be able to see your review. Better Business Bureau – The Better Business Bureau explicitly prohibits anonymous reviews. But there’s a catch. The BBB doesn’t accept anonymous reviews, meaning you can’t submit an anonymous review, but that doesn’t mean you can’t maintain your anonymity. In order to protect users’ identity, the BBB will never publish personally identifiable information. Customers have the option to choose a display name, which will be displayed to the public. Only the business can see the customer’s name, since this is how the BBB ensures that review is authentic. Outside of these platforms, there are a variety of niche sites like Avvo and HealthGrades that can help your business stand out in a particular industry. Although these sites may not be as popular among consumers, they tend to rank very well in search, and most don’t require customers to use their real name. It’s not enough to just ask customers for a review. It’s important to make it easy for them to leave a review. Each platform offers a few tips and tricks for lowering the barrier of entry. When customers follow this url, a window will appear in search results for them to leave a review. It’s that simple. The only catch is that the user needs to have an existing Google account in order to leave a review. Yelp Reviews – Yelp is tricky, since you aren’t allowed to “ask” for reviews. However, you can make it easier for customers to leave a review by linking directly to your Yelp profile page within your email signature, or even on your website. BBB Reviews – Like Yelp, you can embed your BBB badge within your email signature, and on your website. There are a few fields to fill out, so it’s a bit more involved than Google and Yelp, but this is a great option for customers that don’t have active Google and/or Yelp accounts.